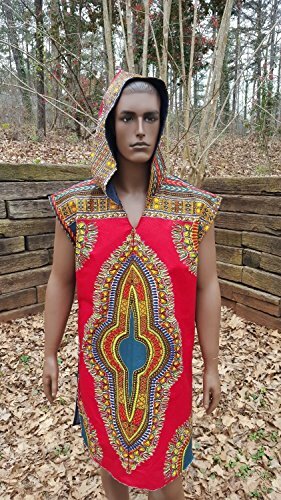 DevitaDesigns Mens Hoodie Shirt 100% Cotton Denim Ankara Tank TShirt Large Dashiki ~Size: Mens Large (42-44), Ready-to-Wear! ~Style: Mens Shirt Hoodie Dashiki Material: 100% Cotton Denim Fabric & 100% Cotton All-Natural Dashiki African Ankara Cultural Fabric! ~Shirt Measurements: (21.5" Wide) Across Chest, (22.5"Wide) Across Back, Front Length 38" inches Long (from Shoulder to bottom hemline), Back Length (from base of neck to bottom hemline) 38.5"inches. If you have any questions about this product by DevitaDesigns, contact us by completing and submitting the form below. If you are looking for a specif part number, please include it with your message.